We have been receiving a lot of queries from our readers regarding relationship issues and we were shocked to find quite a number of people becoming victims of narcissists and psychopaths or people with similar tendencies. In our ever progressing world where most of the people have the tendency to take advantage over others, it’s not easy to identify a narcissist or a psychopath. People who have this type of anti-social psychology show traits of manipulative behaviour. They adopt various ways to control others, especially their peers, to hurt them and get things done. Since such type of people belongs to the category of our loved ones, it’s quite difficult to identify them too. Their primary aim is to take advantage of their peers and also inflict harm upon them. They get these things done in such a way that the victim ends up either getting hurt or having a belief in a different version of reality, which these psychopaths have made them believe. A psychopath or a narcissist knows ways to avoid the blame and instead makes the victims feel guilty of committing that particular offence. No matter how hard it might seem, one needs to be careful and stay away from such people. 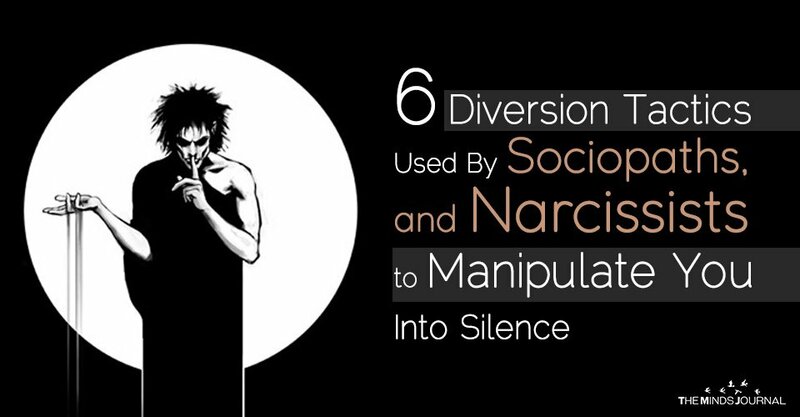 If studied carefully, there are 6 ways and tactics, used by sociopaths, narcissists and psychopaths by which they try to manipulate, control and silence their victims. Remember the ample number of times you might have said something to your peers and they made a war out of it? As the saying goes, rumours spread like wildfires, these psychopaths cash upon this volatility of words. Once you say something, they will mould it in such a ways that others will misread you and misjudge you; this is such a way to defame you and make you seem cruel and harmful in front of others. You should be really very careful if you find such behaviour. You can never fathom how they will do and what. All you will end up is being categorized as insensitive, cruel, mean and similar other epithets. Narcissists always try to control others. They wouldn’t directly try to control you. First, they will try to isolate you from your family and friends. Once they have become successful in doing so, they will cash upon your vulnerability. Imagine a situation where people who meant a lot to you, people whom you were close to start misunderstanding you and even blaming you for no reason at all! You will lose your confidence and become extremely weak, emotionally. Now, the second step of these types of people will be to act like your closest person. They will make you believe that they are the ones who understand you and thereby, they will gain your trust and dependency. Once that’s done, they will indirectly tell you or rather you will be so weak yourself that you will ask them for their help and they will tell you exactly what they want you to do. In this way, they will gain full control over you and get things done.